The French Paris area selected CXR Anderson Jacobson for its intelligent traffic system and convergent urban services over IP project. This global ITS system had to address several challenges such as improving and securing traffic flow, public transport priority, gate and information controls, and traffic light control optimization. The Paris area operator mostly appreciated the CopperWay product for its numerous benefits, but especially for its resiliency features, copper and optical connectivity, low power consumption, scalability on existing copper cables, and rich management capabilities. 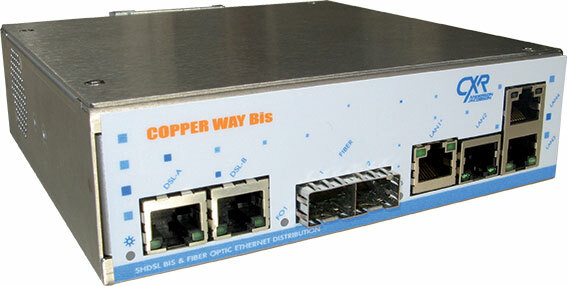 The CopperWay product line saves CAPEX and OPEX in cities moving their traffic light control to IP as it delivers high Ethernet bandwidth over existing copper cables. Equipment provides all communication interfaces required for traffic controllers, video camera, gate control, information display and traffic counters. It is a ruggedized design with unequaled performance, low latency, security and resiliency functions that deserve mission critical applications. CXR products help existing transport networks to make a smooth transition to new technologies and connect both Ethernet and legacy systems to the IP network.